1 Heat the oil in a large saucepan or fry pan and brown pork and capsicum. 2 Add water and bring to the boil., Stir in Rice, cover and cook for 10 minutes, adding prawns and snow peas for the last few minutes of cooking. 3 Stir well, replace lid and stand for 2 minutes. 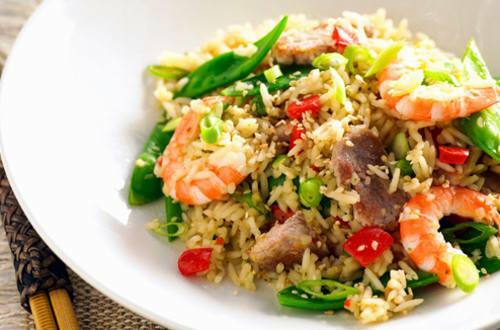 4 Once cold, stir through prawns, snow peas and top with spring onions and sesame seeds.